Over the last century, the impact of the human driven automobile cannot be overstated. However, car usage is likely to change dramatically in the next century due to the arrival of self-driving or autonomous cars. The introduction of which is likely to have an equally large impact. The move from human driven to autonomous cars is likely to have a momentous impact on our lives and society. As well as the convenience and safety incentives for travellers, they will create benefits for society and the environment. In this paper, I look at the social implications of a future dominated by autonomous car transport. I begin with a brief description of the current activity in this technology, and the accepted definitions of the differing levels of autonomy. I also examine the potential benefits that will make the take up of this technology inevitable. There are estimated to be over 1 billion vehicles on the roads at present and that figure is set to double by the year 2040. But given the likely adoption of self driving cars, that scenario now looks very doubtful. They are extensively talked about in the media nowadays with good reasons. As Hars  says: “At the current point in time, self-driving car technology is not yet ready for widespread adoption but there can no longer by any doubt about its viability”. Many companies are racing towards implementation of full autonomy, with some promising success within the next five years. For example, Ford is promising to have a fully-autonomous Level 4 car (see definition later) ready by 2021. This car will have no steering wheel or access to the fuel pedal, and the passenger will never need to take control of the vehicle in a predefined area. The number of companies working on self-driving cars is rapidly increasing and is drawing involvement from technology companies, like Google and Apple, and automobile companies like BMW and General Motors. Google were amongst the first to investigate the viability of this technology with their success in the DARPA Grand Challenge of 2005 . Long distances are now routinely test-driven in cities and other environments using self-driving vehicles. Many of these vehicles will be used by fleet companies to provide taxi and sharing services, and many other uses are planned. We are very likely to see large numbers of these vehicles in our cities within the next few decades. There are however, different levels of autonomy, and these are described in the next section. 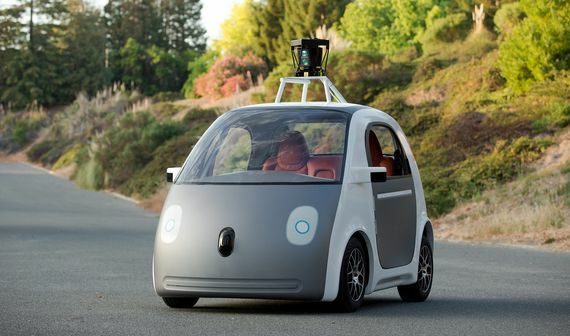 There exist six levels of car autonomy that were defined in 2014 by the Society of Automotive Engineers (SAE) . They take values on a scale from 0 to 5. Level 0 refers to complete driver control, with Level 5 at the other extreme representing completely autonomy in any environment. Level 0: Human Control. All car operational functions are under human driver control. This does not exclude warning indicators that alert the driver to attend to something, such as low fuel. Level 1: Driver Assistance. At this level, technologies, such as Automatic Emergency Braking (AEB) or cruise control, may be controlled by the car to assist the driver, one at a time. Level 2: Partial Automation. At least two simultaneous automated functions may be controlled by the car. For example, acceleration and steering, may assist the driver, but the human driver is still always in control. Level 3: Conditional Autonomy. The car can manage all safety-critical functions under certain conditions, but the driver is expected to take over if and when alerted. The driver must remain vigilant even when the car is under autonomous control. Level 4: Pre-Defined Autonomy. The car is fully-autonomous in some driving scenarios, though not all. Fully autonomous in pre-defined environments requiring no human driver intervention. Level 5: Fully Autonomous. The car is completely capable of self-driving in every situation and environment without any driver intervention. At present, there are several cars on the road offering up to Level 2 driving functionality. A Level 3, conditional autonomy car, called the Audi A8, is ready for use but awaiting approval for use on the roads in many countries. Ford hope to have a Level 4 car completed by the year 2021. The overwhelming benefit is safety. Over 1.3 million people are killed annually on the roads around the world with several million seriously injured. Most of these accidents (over 90%) are caused by human error. According to the US National Highway Traffic Safety Administration , alcohol abuse, speeding, and driver distraction, are the cause of the vast majority of these accidents. But autonomous vehicles will never be susceptible to any of these failings. It has been estimated that driverless cars will save over a million lives each year. Improved driving safety has other implications because car accident injuries take disproportionate healthcare resources. Reducing these accidents could result in massive savings and better use of healthcare facilities in other areas of medical care. Furthermore, because of the fewer number of accidents, the construction of autonomous cars could use some less dense materials like fiber glass, and lead to more efficient travel. Improved safety is a big incentive for car manufacturers because they will gain more confidence from the travelling public. Whilst driving is a pleasurable activity for many people, having to spend many hours commuting daily or undertaking long trips can become a chore. A passenger can spend time doing other things in a driverless car. There will also be fewer of them on the roads. Therefore, less time will be spent in traffic jams. They will all be connected on-line, meaning that they can communicate with each other and coordinate intentions. All this combined should make for a more pleasant and less stressful passenger experience. Cars take up large amounts of space in our urbanized areas. In the long-term however, autonomous cars are likely to substantially reduce the number of cars in use. This means that the vast areas of land, hitherto used for car parking will become available. At present, individuals that buy cars have sole use. This means that they spend about 97% of their time, on average, unused – in garages, car parks, or roads. This is likely to change because the users of autonomous cars in the future would probably be offered access rather than being sold ownership. This type of usage is becoming common nowadays with music and video film users. For example, subscribing to streaming services like Spotify, rather than buying vinyl records or CDs, reduces the requirement for physical storage. Driverless cars will use electric power because they will be harder to operate with fossil fuels. There would be many jobs created from the new technology in developing the new infrastructure required to charge electric batteries, and so on. This would also mean a move away from fossil fuel transport to a less polluting form of energy with fewer carbon emissions – reducing the effect on global warming. Forecasting the way that a new technology will unfold is never easy. However, given the huge benefits arising from autonomous cars they look set to dominate our roads in the coming decades. I have shown in this article that there are many reasons why individuals, businesses, and nation state governments would embrace a future using autonomous cars.